The FASF experiences a first! Every year, more than six large groups of senior level non-commissioned soldier students visit Columbus from Ft. Bliss’ Army Sergeant Majors Academy to study the 1916-17 Punitive Expedition’s battlefields and launching sites. 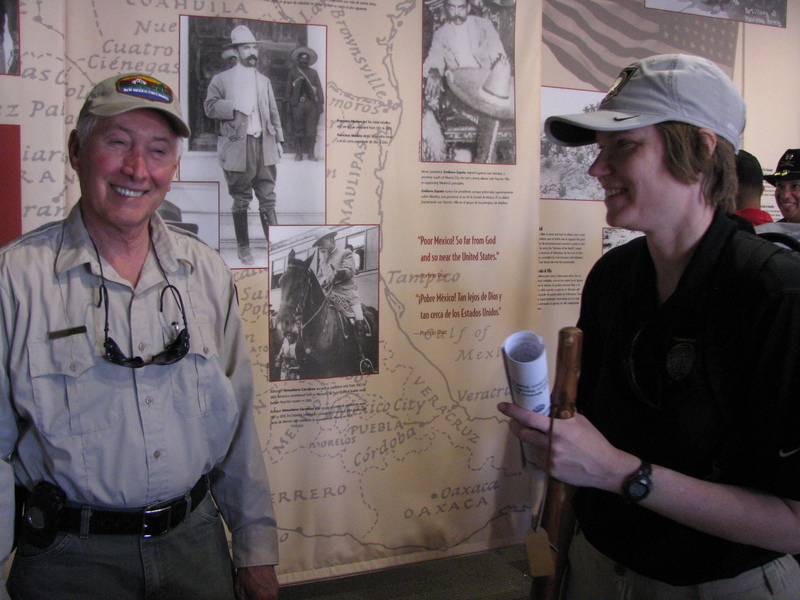 FASF member, John Read (L) explains exhibit layout to Col. Brit Erslev, PhD (R). Note First Aero Jenny in background. But why this new interest from a San Antonio, TX branch of the U.S. Army’s Intelligence & Security Command (“INSCOM“), which is itself headquartered in Virginia? Because its commander is a long time student of U.S. Military History – and Columbus rates high in her list of important U. S. historical military sites. After all, among other firsts, the attack on Columbus in 1916 triggered the 1st deployment of U. S. military heavier than aircraft in sustained combat, as well as the first use and application of mechanized military vehicles. As all good historians know so well, “If we ignore the failures in our history, we are bound to repeat them . . .”And, those Jenny airplanes, in particular, were also busily gathering intelligence for the Expedition’s Commanding General, “Black Jack” Pershing. The publicly stated end-goal in the Punitive Expedition was to find and punish the Mexican rebel, Pancho Villa. But, while we failed to accomplish that objective before withdrawing from our Southern neighbor’s territory, as all close students of the First Aero Squadron know, we did learn – and prove – some other vital military lessons, notwithstanding the mission’s over all inability to achieve its main objective. We discovered the critical need for dependable – and combat ready – military aircraft, which our beloved Jenny was definitely not, at least at the campaign’s outset. But, by the Expedition’s termination on February 7, 1917, only eleven months later, we had debugged and improved the rickety machine into an outstanding and even reliable military trainer. That Jenny, finally perfected enough to go into mass production (over 8,000! ), led to our new ability to train almost 10,000 new Army and Navy aviators, who, when they went to fly in the skies over Europe, helped turn the tide of WWI towards the Allies’ favor. Again, back in 1916, the Punitive Expedition was created by then President Woodrow Wilson for the stated purpose of capturing and punishing the infamous Mexican revolutionary, Pancho Villa, for having terrorized the small sleeping village in the early morning hours of March 9 of 1916. That attack had caught the town and its small Army Garrison completely by surprise and led to 18 American deaths, including some innocent local and visiting civilians. Colonel Erslev had personally attended the FASF’s Presentation this past March 12th, where she had confirmed her understanding of the First Aero’s accomplishments – and of what its mission entailed. Accordingly, Colonel Erslev gathered her troops into three large cross-country buses this past Sunday and transported them to Columbus for an important history lesson, one that directly relates to their Army Intelligence specialty. John Read, elicits chuckle from Colonel Brit when he observes that no one can allege that she’s an underachiever! Good intelligence gathering often depends on either covert or overt Surveillance and Reconnaissance forays into enemy territory. And that, of course, was the primary – and at least partially successful mission of the First Aero Squadron, as it deployed out of Columbus and into Mexico a century ago. Interestingly, more than a century later, that mission is still the main thrust of today’s hi-tech First Aero Squadron, headquartered at Beale Air Force Base just North of Sacramento, CA. The Intelligence Battalion from Ft. Sam Houston is led by this Army ROTC graduate from the nation’s second oldest (1693) University, William and Mary. Among many world-wide assignments in her career, Lt. Colonel Erslev also served at the Army’s Military Academy, West Point. She is now poised to once again return to the famous military teaching facility, however this time as part of its full-time academic staff, as a resident Professor. As a female intelligence specialist and Battalion Commander, she is not a typical Army officer, alone insofar as she has already managed to acquire her Doctorate in U. S. History. With this level of interest in the nation’s past events, particularly its military history, it isn’t difficult to understand Colonel Erslev’s fascination with the historic events that unfolded here in Columbus before and during the Punitive Expedition in 1916 and 1917. Some of Colonel Erslev’s 60 odd troops begin to gather on the PVSP Exhibit Hall’s Patio in readiness for their next Columbus area tour stop. 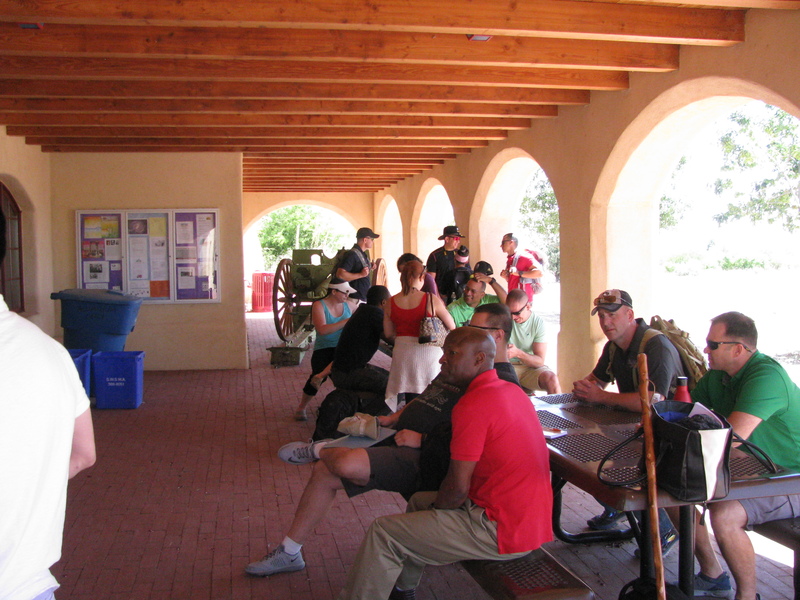 Colonel Erslev carefully planned her field tour, or “Staff Ride,” as the experience is called in the military, by investigating the Staff Ride routine used by the Army’s Sergeant Major’s Academy at Ft. Bliss, in El Paso, TX, which, as mentioned, regularly visits Columbus to explore its rich military history. 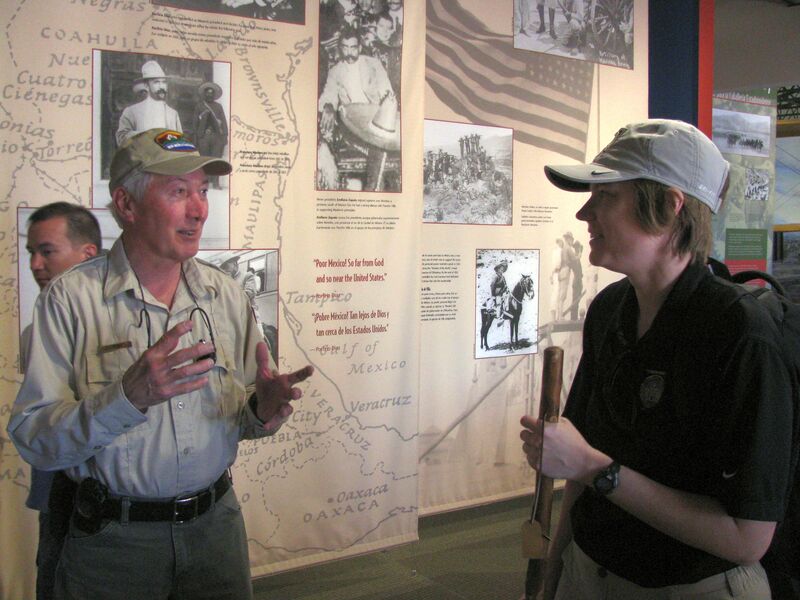 Under the expert guidance of our own local (El Paso, TX) Punitive Expedition Historian, Dr. Robert Bouilly, the Sergeant Majors Academy developed a detailed Staff Ride itinerary for Columbus, one designed for the singular purpose of helping its students understand precisely what transpired here during the Punitive Expedition – and why those developments and experiences are so relevant in today’s modern Army. John Read recalling a funny incident with one of the Sergeant Majors Academy’s recent Staff Ride visits to Columbus. The Colonel’s men and women Intelligence Battalion members arrived in Columbus yesterday, dressed in casual civilian attire, so easily blended in with the other civilians about town. They spent over five hours visiting and studying the century old battleground, the town itself, and the old Fort site. 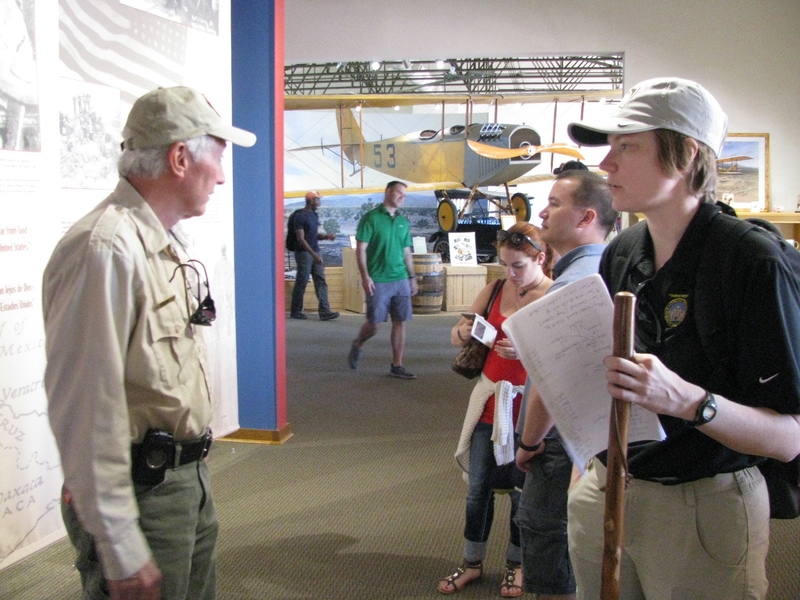 They were carefully guided through our local Columbus Historical Society’s Museum and also the Pancho Villa State Park’s Exhibit Hall, where FASF member and Chief Park Ranger, John Read (above), made sure they they were all warmly welcomed. The FASF would like to formally thank Colonel Erslev for attending our annual presentation last March and for bringing her soldiers this long distance just to visit Columbus and it’s numerous other surrounding historical sites – and for taking some FASF membership application forms with her. We hope to have her join our ranks – – – and wish her and her Battalion the very best! This entry was posted in HOT NEWS! on May 9, 2017 by FASFRIC.